You know the tee. You know the beautiful print in Wesley’s. And you know The Blade-published book. 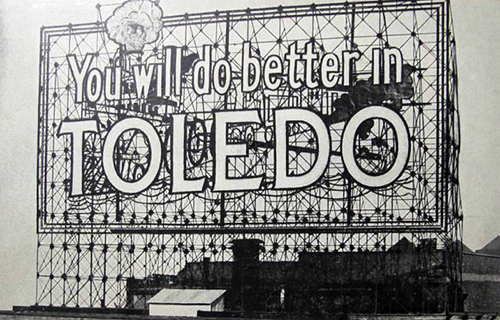 December 17, 1913 is the first day the iconic Toledo slogan sign was first lit. 100 years ago! 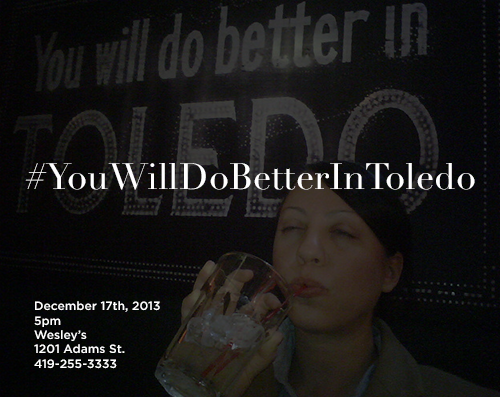 Your fellow Toledo-lovers propose Tuesday, December 17th, 2013 as “You Will Do Better In Toledo Day”. Let’s meet at Wesley’s in Uptown at 5pm for drinks, nibbles, and fun! The goal is to spread awareness of the day as much as possible in the next few days. On Facebook, Twitter, and Instagram we are encouraging people to share photos with the hashtag #YouWillDoBetterInToledo. Start posting now! At the end of the day, there should be quite a collection of awesome things about Toledo. Here’s some local coverage from The Blade and Toledo Free Press. Much Toledo Love from Jupmode, Smash Toledo, Enjoying Toledo, and all Toledo lovers!